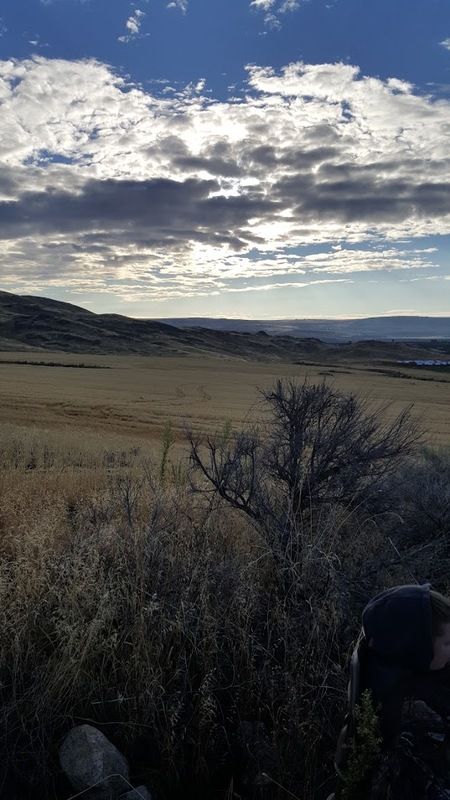 I just got back from a week long trip to Eastern Washington to go dove hunting. Although the weather turned and pushed the doves out we all had a great time. It truly was a very needed vacation. My new dog, Angus, got a chance to do some retrieving and working the fields. This was his first real time out chasing birds and he did great. After a few years of experience, I think he will be one incredible bird dog. 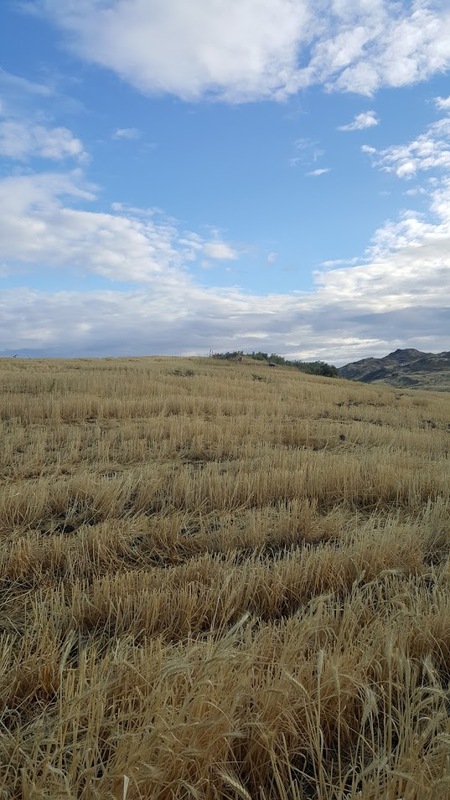 Here are a few shots of the area where we hunted. The doves, when they aren’t pushed out due to a turn in the weather, are usually pretty thick. When we went a few years ago I had my limit in about 3 hours. This time I couldn’t hardly hit a thing, but my wife got her first 2 critters ever. It was her first time hunting. She did great. I only got 5 and my father got 2. The wind was pretty harsh that first day when the doves were still in so getting the lead down was almost impossible. All said, we had a great trip and my dog got some really good training. 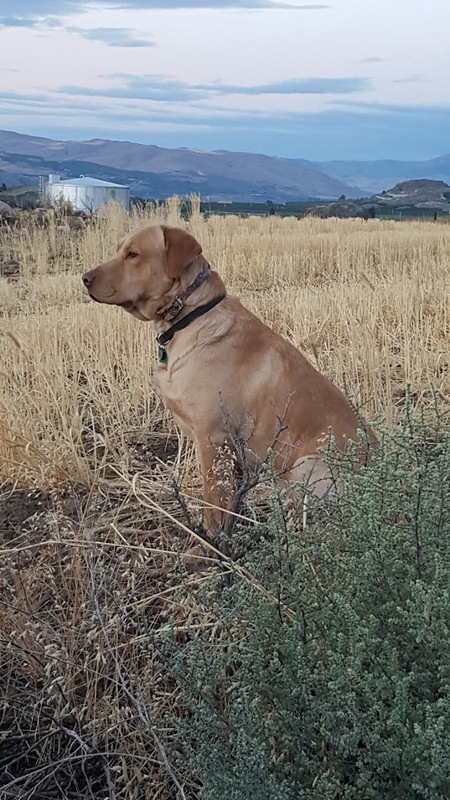 He started to learn how to walk a field, used his nose to find a few down birds, and retrieved them for us. We had to kind of walk him out a bit at first, but he really did great. I really can hardly wait for duck season. Getting him to go for his first water retrieve should bring big grins! 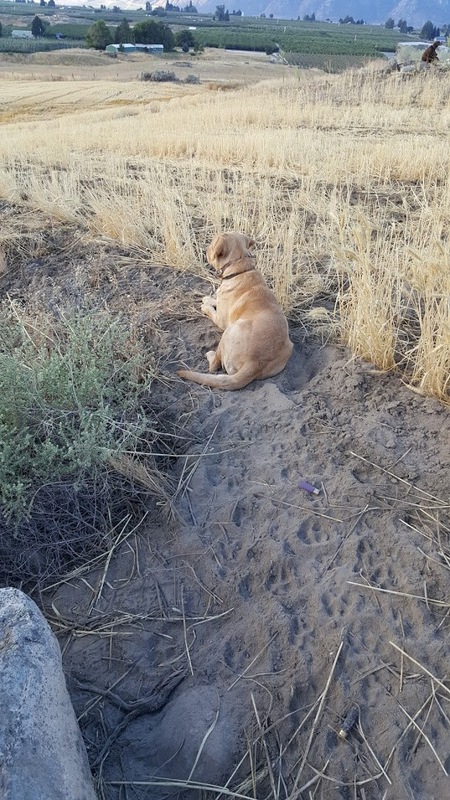 This entry was posted in Miscellaneous and tagged dog, dove, dove hunting, hunting, labrador, retrievers on September 6, 2016 by Woodsbum. Here is another interesting article that I felt inclined to include. This one I actually agree with. The fact that I own 4 of the 5 only holds a HUGE amount of weight to how I see this article…. Just saying. I want to let all you in on a little secret. Some guns are just too impactful on a shooter to let you go through life without shooting them. Many of you may already have spent some time behind some of these rifles, but I have a feeling that some of you shooters haven’t shot all five. Let’s take a look at what I feel are five rifles that you should shoot at least once. 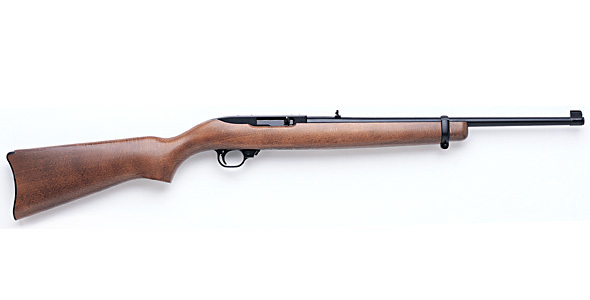 The Ruger 10/22 has been a staple for many new and experienced shooters alike for over 50 years. Not only is it incredibly accurate and reliable, but it is infinitely customizable with thousands of options for aftermarket stocks, barrels, triggers and so on. With the price to get into one of these rifles at right around the $220-$240 mark, not having one in your collection is a disservice to yourself. Right out of the box, they provide a very pure shooting experience that will make even the best shooter better for pennies on the dollar. The Remington 700 is the first choice for precision shooters, hunters, police, and military since the early 1960s. A proven platform that lends itself well to whatever task you might have at hand while being almost as customizable as the 10/22. Working on your rifle shooting fundamentals with the strong and accurate bolt action will teach a shooter many things—along with how to handle a good bit of recoil. There are few things as much fun as lobbing big .30 caliber bullets hundreds of yards onto a tiny target. Going through life without experiencing the Remington 700 would be just wrong. Some of my most enjoyable range days have been spent behind one on the 500-yard bench. Marlin introduced the 336 in 1948. Since then, no rifle in America that has put more food on hunters’ tables. Marlin introduced the 336 in 1948. Since then, no rifle in America that has put more food on hunters’ tables. I almost chose the Winchester 94, but felt the side ejecting 336 would be a better fit for the modern shooter because it allows you to mount a scope low to the receiver. It is hard not feeling like a cowboy when cycling the lever action. I have to admit, the 336 is quickly becoming a fast favorite of mine. I really enjoy the hard-hitting .30-30 cartridge when milling around in the hunting lease’s dense forest. The 336 rides with me in the truck just in case I run out to the lease on a whim. Getting into a good lever gun can be done for under the cost of a name brand handgun making it an affordable rifle to add to your collection. The thought of going through life without experiencing America’s most popular self-loading rifle gives me chills. It has become one of the most adaptable rifles on the market with a blue million calibers to choose from, barrel lengths, different stocks, and accessories coming out the wazoo. The AR-15 in its purest form is the rifle that you really should get behind. The 5.56 (or .223 Remington) is incredibly light recoiling while still packing a nice punch downrange. I personally introduce most new shooters to a self-loading rifle on a 20-inch AR-15 with standard A2 carry handle with iron sights. The beautiful thing about the AR-15 is that after you spend some time on the rifle, you can modify the rifle to your taste. Who can say no to the classic AK-47 chambered in the powerful 7.62×39 cartridge? It isn’t me, that’s for darned sure. Right now is an exciting time for those of you that are after an AK-pattern rifle with so many great options on the market and big manufactures—Magpul et. al—getting behind the accessory market. The rugged reliability that has made the AK legendary is something that every shooter is sure to enjoy. Out of all the centerfire rifles on this list this one is the most economical to shoot steel-cased 7.62×39 ammo coming in at under a quarter per round. Couple the inexpensive nature of the ammo with the industrial feel that the rifle has in your hands and you have something really special that you should really treat yourself to. There you have it. Now get out there and shoot these fine rifles, your trigger finger will thank you. Again, I own 4 of the 5 models listed above. The only one I do not own is the AK-47 and that is because I opted for another AR in a slightly different configuration. The AK also does not fit me as well as the AR. It is definitely one of those rifles that deserves to be on this list, however. For those that are looking to start out with rifles and have no idea what to get, I would suggest any shooter just go buy the 3 hunting rifles and then choose the AR or the AK. With those 4 rifles, assuming you get the 700 in one of the larger .30 caliber options, you can hunt every furred animal on the North American continent. By adding what is called a “battle rifle” by many, you then add self defense to the mix and have a well rounded arsenal with minimal expense. No matter how you shake it, these rifles are really the gold stand for each of their respective classes. Go out and try your hand with each one and have some fun! This entry was posted in Firearms and tagged 5 Rifles You Should Shoot Before You Die, battle rifle, best battle rifles, best guns, best hunting rifles, best rifles, good rifle collection, hunting, hunting collection, prepper guns, prepper rifles, rifles on November 6, 2015 by Woodsbum. In the last few years I have seen a huge number of articles about how smaller calibers are just as effective as larger calibers. As a matter of fact, I noticed this increasing dramatically over the last two hunting seasons. As someone who has been hunting since they were 4 years old I find it quite distressing that these “gun experts” are pushing for something that seems more of a trend than actual common sense. You Don’t Need A Magnum Rifle! More than any other group of hunters, American’s suffer most from Magnumitis. And why not? We’re the land of bigger, better and brighter, right? Better add ‘battered’ to that list. American shooters think they know a lot about magnum rifle cartridges and performance, but after they shoot one they’re positive they know one thing—recoil. Magnums batter at both ends. Experienced magnum shooters sneer at that. Recoil doesn’t bother them. But it bothers others, often to the point of ruining their shooting. Flinch. The 7mm Rem. Mag. will throw a 150-grain bullet farther than a 7mm-08 Rem., but a laser rangefinder can compensate for that. Then it’s just a matter of selecting the correct aiming point and putting the bullet in a vital spot. The so-called magnum advantage really isn’t. Magnums don’t kill harder, deader and faster than most standard rounds. Friends and I have proven this to ourselves while taking literally hundreds of big game animals with everything from .223 Rem. to .458 Lott elephant rounds. We’ve watched elk drop in their tracks when hit with a 243 Win. and coyotes dash 30 yards after taking a .300 magnum through the boiler room at 50 yards. We’ve shot through jackrabbits with a .357 Mag. without even slowing them down. And we’ve watched 2,000-pound buffalo collapse in their tracks when hit with a .270 Win. In short, magnums just don’t always deliver the knockout punch they’re supposed to. This doesn’t mean they’re puny or underpowered—it just means that bullets don’t perform like the punch from a heavyweight boxer. Despite all those foot-pounds of energy in a magnum, it’s not going to hit like the hammer of Thor and pound all game into an early grave. A puny, little 140-grain .270 Win. bullet broke the neck of this 2,000- pound Australian water buffalo and anchored it in its tracks. A bullet can absolutely pulverize the heart and lungs of a critter while barely jolting it. Until blood pressure to the brain drops sufficiently, the animal goes about its business. Usually that’s running away, but sometimes it’s just standing there or walking or even eating. Many times game doesn’t even know it’s been hit until it falls over. This takes anywhere from 3-20 seconds—sometimes longer—regardless the energy with which the bullet struck. So why fool around with magnums? For extra reach. By throwing bullets faster, magnums throw them farther before they fall too low to hit your target. This is all relevant, but many magnums can add 20-60 yards to your dead-on shooting distance. They still recoil smartly doing it, so if you don’t appreciate that, choose a non-magnum cartridge and make up the shortfall with a laser rangefinder. A 95-grain bullet from a .243 Win. is NOT supposed to be used to shoot Dall’s sheep at 450 yards, but no one told Spomer, his rifle, his ammo or this ram. A laser rangefinder offsets the magnum reach advantage by nailing precise distance to target. Once you know that, you just raise your sights or dial your turret or choose the correct ballistic reticle to put your bullet on target. If that target is the central nervous system, dead right there. If it’s the heart/lungs, give things a few seconds to work out. Regardless whether your bullet lands with magnum or standard energy, it’s not going to bounce off. Now I can understand, especially considering I am an archery hunter, how important shot placement is when harvesting game. I have seen numerous bad shots in my day. Actually, I have seen enough bad shots in my day to make me understand certain needs for certain environments. Countless times I have seen under powered rounds used on large game that would just not do the damage needed to put the animal down ETHICALLY. Harvesting a mule deer with a .22 lr is definitely possible. As a matter of fact, I have seen it several times. A .22 lr shot to the head is more than sufficient many times. My great-uncle’s favorite deer round was actually the .22 mag and he would take them while they were out near his chicken coup at his ranch on the reservation. Again, they were head shots. The animal went down immediately and there was no suffering. As far as chest shots go, I have seen more animals shot with smaller caliber rounds that ran off and were never recovered, wounded, slowly bled out or had to be shot again to fully expire them than I have ever seen with larger calibers. Great examples of this are the .270 fan boys who think that their “expert” shot placement is more than sufficient to take down an elk. One of the first elk I ever saw harvested had a .270 bullet lodged in a lung. The wound had healed and it had obviously lived at least another couple seasons after having been shot. This elk was taken with a .338 mag and only a single shot to the heart/lungs. This was not the only wounded animal I have seen in my life due to an under powered hunter. I have seen 150 gr 30 caliber round nose bullets in chest cavities (30-30 round) and many 7 mm bullets that just did not do the job. Firearms are mostly using hydrostatic shock as a way to put an animal down. The kinetic energy from the fired bullet is transferred to the object it strikes. The quicker that a bullet can transfer that energy to the object it strikes, the more damage can be done to the tissue. It is a very simple concept. If you can get more energy associated with the bullet’s trajectory through increasing mass or velocity, the more energy is available to be transferred. Dropping either mass or velocity decreased energy. Larger animals have more mass, larger bones, and potentially higher density that your bullet has to penetrate. This will cause your bullet to slow down quicker upon entry and leave less energy to do damage to the internal organs. In case you were unsure as to where you wanted the energy to be transferred, this is it: the internal organs particularly those with a high concentration of blood to allow the animal to exsanguinate (bleed out) or no longer circulate that blood properly. Of course lung shots create a pneumothorax where air enters the chest cavity and the animal will expire due to suffocation. Either way, you need to do enough damage to those internal organs to put the animal down in an effective and timely manner. If your bullet loses a lot of its energy just penetrating the chest cavity there will be less energy to do the job of putting that animal down. The more energy left, the more damage internally. What happens if your bullet passes nearby or just nicks a vital organ without fully transferring that kinetic energy and doing the required damage? Your animal is merely wounded and does not expire from being shot. Large bore projectiles do damage the same way, but with a twist. They usually use some sort of design that allows for greater penetration of the animal. Taking a 45-70 as an example, I use a 405 grain bullet that travels around 1800 ft/s where a 300 Wby will push out a 180 grain bullet at about 3200 ft/s. This is over 2x the bullet weight at about 56% of the velocity. Basically, it hits like a cinder block being shot out of a cannon at close range. It does an incredible job at penetrating animals, vehicles, or even trees. With longer barreled rifles and modified loads for rifles such as the Sharpes it can even be a very effective long range rifle. Just research Billy Dixon. This entry was posted in Firearms and tagged big bore, big guns, hunting, magnum calibers, magnum rifles, rifle bullets, rifle caliber, small caliber guns on August 17, 2015 by Woodsbum.